← Mutated Coyotes on Cape Cod? 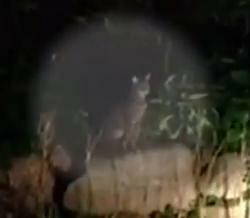 A North Falmouth resident shot video of what was confirmed by MA State DFW officials to be a bobcat. This is the first officially confirmed report of a bobcat on Cape Cod since Colonial Times. Rumors of large cats have been circulating on Cape Cod since at least 1981 when the “The Beast of Truro” or “Pamet Puma” was thought to be roaming the outer Cape. NORTH FALMOUTH — Local and state wildlife officials have confirmed that a Falmouth man has video of the first documented bobcat on Cape Cod since Colonial times. Chris LeBoeuf, who lives on Teneycke Hill Road, was returning home around midnight Aug. 9 when he spotted a large feline in his yard, said Chuck Martinsen, deputy director of the Falmouth Department of Marine and Environmental Services. LeBoeuf said he wasn’t at first surprised to see an animal — which he described as about the size of a small- to medium-size dog — in his yard when he pulled into driveway. His property, located 12 miles from the Bourne Bridge, abuts conservation land, where wildlife thrives, he said. Last year, a mountain biker claimed to have seen a bobcat in North Truro. Its really hard to tell what this guy saw from the video below.